This time of year brings about an interesting conundrum. Whether you’re pumping your home full of heat or still keeping the A/C on, it’s important to keep that conditioned air locked inside. What a waste to spend money bringing your indoor air to the perfect temperature just to have the air escape, leaving you to heat or cool new air all over again! However, making your home air tight isn’t the best for your home or your health. Ventilation is necessary to rid your home of natural and man-made air pollutants that build up over time. Natural ventilation, such as opening doors and windows, is easy, but makes it difficult to control the temperature and humidity levels of your indoor air. Luckily, there are many solutions to ventilating your home, including some that will help keep you from wasting extra energy heating or cooling fresh air. 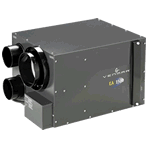 The simplest mechanical ventilation device is an exhaust fan. As these devices are relatively common, we won’t spend too much time elaborating on them. 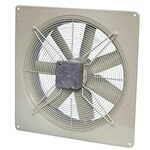 However, there are several varieties of exhaust fans that are good to distinguish. Surface-mounted fans, such as bathroom fans, are simple fans that evacuate moisture, odors, and other contaminants from the area they serve. These fans are found inside the room (typically mounted on the ceiling) and connect to the home's exhaust ducting system. Because they are located in the room, many fans are combined with lighting fixtures – some even hiding the fan almost completely. Inline duct fans are installed in a remote location within the duct system and allow for the venting of multiple spaces with just a single fan. This means that when you flip the switch in any room the fan services, all rooms will be ventilated at once. Since the fan isn’t located in the space being ventilated, it reduces the noise made by the fan, a big benefit for those bothered by the loud buzz of a typical surface-mounted fan. Kitchens should use exhaust fans as well, primarily over the stove. Everyone has the embarrassing experience of burning something on the stove and making the fire alarm go off. Not only will a range hood above the stove help eliminate any unwanted noise pollution from the alarm, but it also removes harmful particles resulting from the combustion process that happens during cooking. It will also exhaust moisture build-up and that terrible smell of your experimental-recipe-gone-bad. When an exhaust fan is used in absence of a fresh air input device, a good deal of negative pressure is created in the house. This leads to many adverse symptoms, including mold and mildew growth, back drafting of combustion fumes, musty smells, and even physical ailments such as headaches. In addition, it forces outdoor air to infiltrate your home’s barriers and sneak inside uncontrolled in order to balance the pressure differences. To best address this issue, it can be helpful to use a whole-house ventilation solution, such as an air exchanger, heat recovery ventilator (HRV), or energy recover ventilator (ERV). Each one is best suited for a different type of living environment, and we’ll discuss their differences and benefits below. 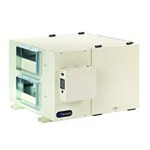 Air exchangers do exactly what their name suggest, exchange stale indoor air for fresh outdoor air. This eliminates the issue of negative pressure caused by a lack of controlled fresh air intake by exhaust fans. 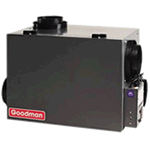 Unlike exhaust fans that operate only when switched on, air exchangers typically run all day and all year round. This means you can rest easy knowing that you are always getting a healthy dose of fresh air in your home no matter what may be going on inside (this doesn’t mean that you shouldn’t take precautions when engaging in activities that cause high amounts of air pollution, but it does ensure that much of the pollutants will eventually leave the home). Since air exchangers simply send out indoor air without saving any of the conditioning applied to it, they are best suited for mild climates that require little conditioning. In climates with more extreme summers or winters, HRVs and ERVs are a better option. HRVs and ERVs are incredibly helpful ventilation devices. Not only do they bring in fresh air and exhaust stale air from the entire home, but they also transfer heat between the two air streams without ever having them meet. This works by passing the two air streams through a heat exchanger as they flow through the ventilator. This means that they will reduce the amount of temperature conditioning needed for the incoming air. Imagine that it’s winter and you have heated your indoor air to a comfortable temperature. As that stale air leaves your home through the HRV/ERV, it will pass through the heat exchanger and give off most of its heat to the cold incoming air, reducing the amount of energy you need to spend heating up that new fresh air. The opposite works, as well, in the summer or in warmer climates. In this case, the warm incoming air gives off its heat to the outgoing conditioned air, dropping the temperature of the incoming air naturally and making it easier to cool down further upon entering your home. In the summer, though, HRVs will continuously introduce humidity into the home, so they are not as useful in climates with long summers or high humidity. If an HRV is right for your application and you're really concerned about your indoor air quality, some HRVs even come with a HEPA filter to trap minuscule airborne allergens and particles. ERVs, on the other hand, are even more advanced than HRVs. Not only do they transfer heat between air streams, but they transfer moisture, as well. This is accomplished by using a heat exchanger made of a porous material that only allows heat and moisture through, while keeping pollutants out. This can be very helpful for homes in humid climates with long summers, where it is helpful to keep the humidity from the incoming air out of the home. Based on the same logic, an ERV shouldn’t be used to ventilate bathrooms and kitchens, since rather than remove unwanted moisture from these rooms, an ERV will work to keep the moisture in the air. Before installing the perfect ventilation solution, it’s always best to work with an expert. Not only do you need to make sure that you get the right type of ventilation device, but proper sizing will determine the effectiveness and efficiency of the unit. We at eComfort.com offer both a wide selection of ventilation solutions and also free professional sizing estimates from our in-house engineers. 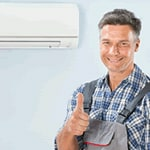 If you’re looking to improve your indoor air quality and want to make sure you do it right, contact eComfort.com today. We’ll make sure that no matter what the weather, your home stays eComfort-able. Breathe Easy with Fresh Indoor Air - Ventilation Solutions for Your Home. Our heating, ventilation and cooling equipment how-to library can help you pick the perfect comfort solution for your home.